OXFORD, Miss. 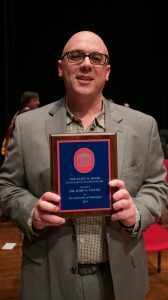 – Glowing, superlative-filled recommendation letters paint the picture of a professor who “pours his heart and soul into his work.” Those comments from University of Mississippi students have led to John Young, associate professor of psychology, being named the 2019 Elsie M. Hood Teacher of the Year. The honor, which is the highest one bestowed on those who make a difference in the classroom at the university, was presented to Young Thursday evening (April 4) at the Gertrude C. Ford Center for the Performing Arts as part of the annual Honors Convocation. Young said he was taken aback to win the award, given the strength of the university’s faculty across the board. Assistant, associate and full professors are eligible, except previous recipients of the award. The winner receives a $5,000 prize and a personal engraved plaque, and their name also goes on a permanent display in the J.D. Williams Library. “Dr. 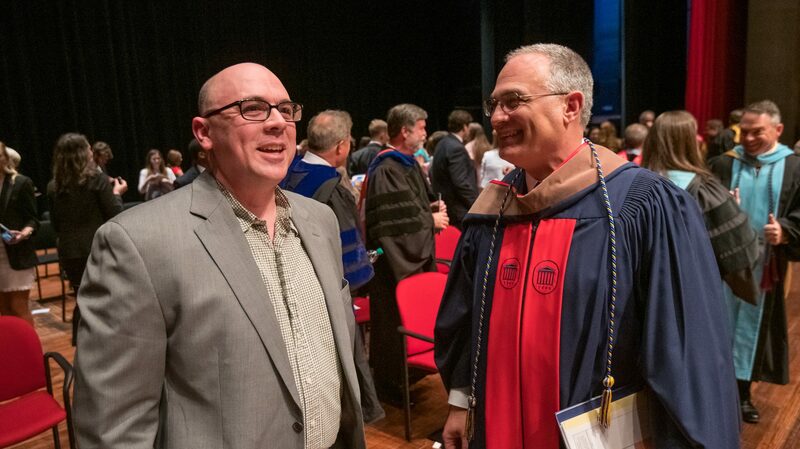 Young is an exceptional teacher, well-regarded by his students for his extensive knowledge and his ability to make subjects engaging,” said Interim Chancellor Larry Sparks, who presented the award. The Elsie Hood selection committee comprises previous recipients, along with the director of Alumni Affairs and a student representative. Criteria include nominating letters that describe examples of exceptional teaching and letters that have been submitted for the nominees in previous years. The Faculty Senate submitted a proposal to Chancellor J. D. Williams in 1965 to create a program of recognition and awards for superior teaching. The following spring, a committee solicited nominations for an Outstanding Teacher Award from faculty, students and alumni. Vice Chancellor W. Alton Bryant suggested that the award be presented on Honors Days and announced during Commencement exercises, and this has remained the policy. Ann Monroe, School of Education assistant dean and associate professor, was the 2018 recipient of the Elsie M. Hood award. Previous winners also include John Rimoldi, Kenneth Sufka, Mark Wilder, Laurdella Foulkes-Levy, David Willson, Gregory Schirmer, John Neff, Kelly G. Wilson, Ethel Young-Minor, John O’Haver, Ann Fisher-Wirth, William Berry and Bob Brown. Rimoldi, a professor of medicinal chemistry and environmental toxicology in biomolecular sciences, chaired the selection committee and noted a common thread in letters supporting Young. Another student also was effusive in praising Young’s work. The student said Young made them fall in love with the epistemological method and also influenced their decision to pursue a career in academia. Young said it’s particularly meaningful to him that students thought enough about their experiences in his classes to take the time to nominate him.